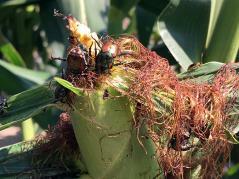 URBANA, Ill. – A team of Extension researchers from the University of Illinois College of Agricultural, Consumer and Environmental sciences has published its 2018 field research results related to crop pests and diseases in Illinois. The report, “Applied research results on field crop pest and disease control,” is available online and includes evaluations of plant varieties, management practices, and products for insects, nematodes, and diseases in corn and soybean, as well as results of statewide pest surveys. Report author Nathan Kleczewski, a plant pathologist and Extension specialist in the Department of Crop Sciences at U of I, says the report serves multiple purposes. “It is a repository for applied disease and pest management studies and data. Too often, we see applied research trials go unpublished for various reasons, or data disappear into the ether,” he says. Kleczewski notes the report also includes information on management practices that didn’t work. “In applied research, the lack of an effect of a management practice is just as important as if a practice has an effect. Why? Because management costs money and we want our producers to be as profitable as possible. If something doesn’t work, we want that information out there just as much as if something works,” he says. The report contains the first year’s results from a two-year corn nematode survey across the state. A similar survey was done about a decade ago, but Kleczewski says the results were never published. “There are many new seed treatments being advertised in corn, but we really don’t even know what nematodes we have in the state and their relative abundances,” he says. As Kleczewski points out, producers need to know what pathogenic nematodes they have before deciding whether to purchase seeds with expensive nematode-protectant coatings. “In this year’s survey, we saw that nematode abundances were generally low, and most species present are not considered to be especially damaging. Lesion nematodes were fairly prevalent, but different species of lesion nematodes can vary in their ability to damage corn roots. We plan to do more research into these organisms in 2019,” says Kelly Estes, report co-author and agricultural pest survey coordinator for Illinois Natural History Survey. The report also contains insect control evaluations for western corn rootworm and Japanese beetles, headed up by Nick Seiter, an entomologist in the Department of Crop Sciences. “These are two of the most important pests of field crops in Illinois, so I think this information will be valuable to many producers,” he says. The team plans to release an annual report each year.